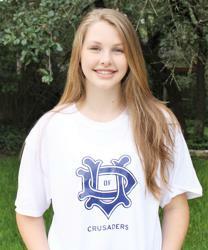 Ingrid Stading Commits to University of Dallas! We are excited to announce Ingrid Stading has committed to the University of Dallas. Texas Eclipse is very proud to see Ingrid, a 2019 graduate, head to Dallas following her season with 18 Under Armour to join the Lady Crusaders! Ingrid currently attends Westwood High School and will be entering her 3rd and final season with Texas Eclipse. Ingrid has an outstanding work ethic and is the definition of a true competitor. She has been a key contributor to the success of every team of which she has been a member. We wish Ingrid the best as she enters the next stage in her volleyball career. We know she will be a success! Go Crusaders!